Arbor Teas T-Shirt "Drink Organic Tea"
Save time and stop worrying about running out of the tea you drink most! More questions? Read here for more info. 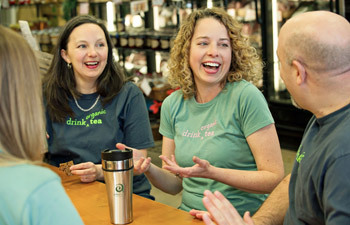 Our newest T-shirt is made from 100% organic cotton and shows off your love for tea! With the words "drink organic tea" printed on the front and the Arbor Teas logo printed on the back, it is available in a women's cut (teal) and unisex cut (blue). So whether you're a fan of the company, want to show off your local pride (here in Michigan! ), or simply need a new T-shirt to bum around in, we offer the superbly comfortable Arbor Teas T-shirt. PLEASE NOTE: these t-shirts are cut rather "fashionably," so if you prefer a fit that's not quite so clingy, consider buying one size larger than you would normally.